This document is suitable for any business which calls itself a scientific, technical or IT consultancy. Of course your industry sector affects the work you do. But this is a legal document, not a specification for your work. 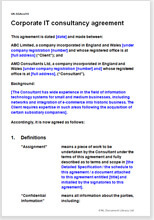 This contract is for a corporate IT consultancy to present to any client as its contract. See below for alternative consultancy contracts. It may be edited either by you before you submit it, or in negotiation with your client. It is drawn to protect you, the consultancy, but should also be acceptable to your clients.